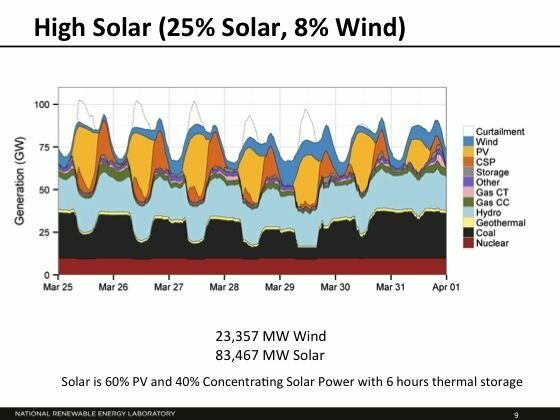 What Are the Impacts of High Wind and Solar Penetration on the Grid? An NREL study looks at the cycling impacts of wind and solar on conventional generators. Increasing proportions of wind and solar connected to the grid will influence the fossil fuel generators on the grid. The question is, how much? Each regional grid in the U.S. is a complex system impacted by the addition of any generation, and to a larger extent, variable renewable generation. Fossil fuel generators have to work harder, ramp faster and turn on and off more often with greater renewables penetration. That means less efficient operation and more wear and tear on the equipment. It means potentially more emissions -- and higher costs for the consumer. 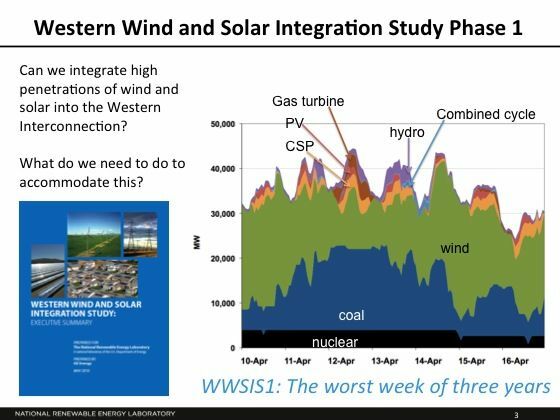 A just-released report from NREL, sponsored by DOE and co-authored by Dr. Debra Lew and Dr. Greg Brinkman, provides a "high-level overview" of wind and solar integration and the emission and cost impacts of cycling on fossil-fueled power plants in the Western U.S.
Dr. Lew comments, "The worst week of the three years is shown here [see below]. Utilities were concerned about the high levels of cycling of thermal units. They asked us to detail the cost and emissions impacts of this cycling. Now we all know that the primary benefit of 1 megawatt-hour of wind or solar is to displace 1 megawatt-hour of other generation, typically fossil-fueled generation because that is what’s on the margin. Displacing a megawatt-hour of fossil-fueled generation displaces the costs and emissions associated with that fuel. But a secondary impact of wind and solar can be to increase cycling of fossil-fueled generators. 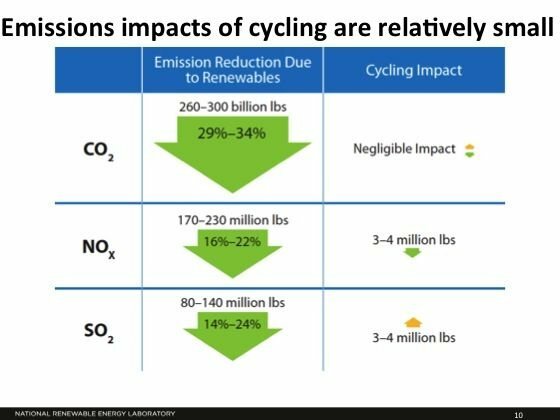 There are wear-and-tear costs and emissions impacts associated with cycling." How large are the secondary impacts? Do the secondary impacts negate the benefits of renewable energy? This is not the first time a study of this nature has been performed. A recent OECD/Nuclear Energy Agency study found that systems costs could be an order of magnitude higher for renewables than with conventional generation due to balancing, interconnection, and backup costs. A response from Climate Spectator refuting those findings is here. NREL's Lew said that some past studies show that wind actually increases overall emissions or that the "avoided emissions from wind have been significantly overstated." It's a complex issue. The grid is an intricate, highly regulated machine which excels at keeping the lights on by boiling water with gas, coal, or nuclear and spinning something. Wind, solar (and storage) have costs and natures that are less familiar and not as well defined and do not yet have a full regulatory seat at the table. Some key slides from the presentation follow. 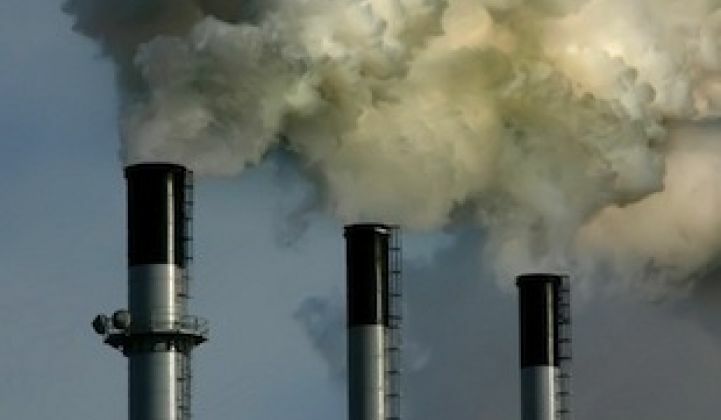 The report's methodology included gathering an emissions data set from each unit in the Western Interconnection (WI) that showed how much incremental emissions were added when that plant was operated at partial load. NREL assembled a technical review team of 50 utility power plant and operations experts to make sure the results, assumptions and methodologies "are realistic and reasonable." The Western grid is one synchronous grid which includes some of Canada and Mexico. Lew emphasized that this study is just for the WI, and that other grids could have very different findings. "We wanted detailed wear and tear" data on hot start versus cold start, said Lew. The researchers modeled operation of the WI for a year. "We wanted to capture all these interchanges, which is why we modeled the entire territory." The researchers developed five scenarios: no renewables, low renewables, high wind, high solar, and high mix at 33 percent penetration. Lew notes that in the 33 percent scenario, coal plants are being backed down in the middle of the day and run at minimum generation level. Gas turbines are being turned on to meet evening peak. 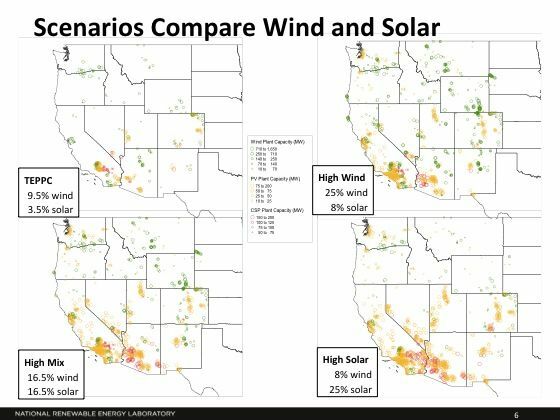 Lew comments, "We created five hypothetical scenarios: A 'no renewable' scenario which is not shown here; the TEPPC scenario in the upper left shows a low, 13 percent penetration of renewables (this scenario is modeled upon the WECC TEPPC case of states meeting their renewable energy targets for 2020); and three high, 33 percent energy penetration scenarios. We divided this 33 percent renewables into different mixes of wind and solar to allow us to compare impacts of wind and solar on the power system." Emissions impacts of cycling fossil fuel generators are "relatively small," according to the researchers. 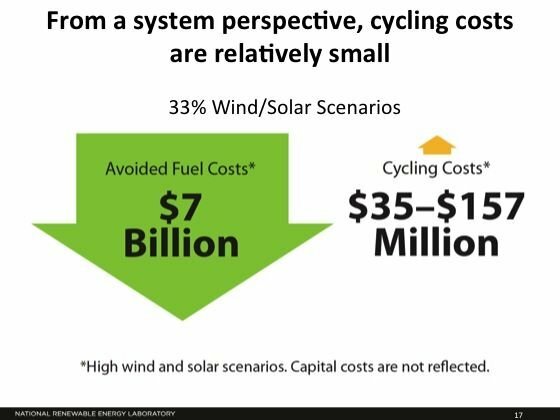 Lew notes, "If we just focus in on the cycling cost for each of the five scenarios, we can see the range of cycling cost for each scenario here." Note that there is cycling even in the "no renewables" or "low renewables" cases. The findings indicate that the 33 percent wind and solar mix costs $35 million to $157 million per year in the WI. Lew asks, "OK, now is that $35 million to $157 million per year a big or small number?" The answer is that it depends on one's perspective. 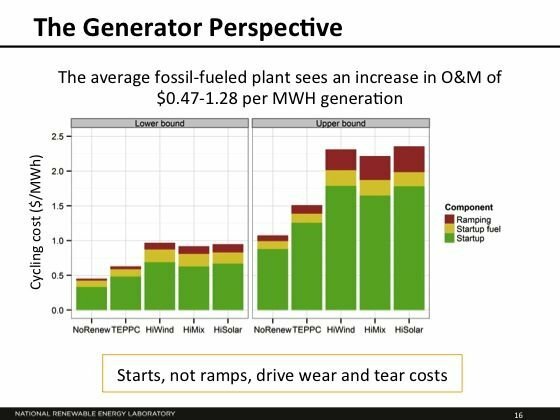 "From the perspective of a fossil-fueled plant, they see an average increase in their O&M of $0.47 to $1.28 per megawatt-hour of fossil-fueled generation. Now from their perspective, they are generating less, likely earning less revenue, and their O&M costs have increased. That may make it hard for them to remain economically viable." She adds, "This graph shows the cycling cost for the average fossil-fueled plant in each of the scenarios. You can see that starts, not ramps, drive wear-and-tear costs." "Now let’s consider the system perspective: the primary benefit of wind and solar is to displace other generation, typically fossil-fueled generation. That primary benefit is $7 billion. The secondary impact is to induce cycling. That secondary impact is $35 million to $157 million. We originally sought to determine the magnitude of this secondary impact and whether that secondary impact significantly negated the primary benefit." In Lew's words, "Cycling costs are relatively small compared to the primary benefit of displacing fuel costs." The NREL team's results "disagree with some previous studies, showing that wind does not increase overall emissions and that avoided emissions from wind and solar have not been significantly overstated." The findings note, "There is cycling happening today even with no renewables." 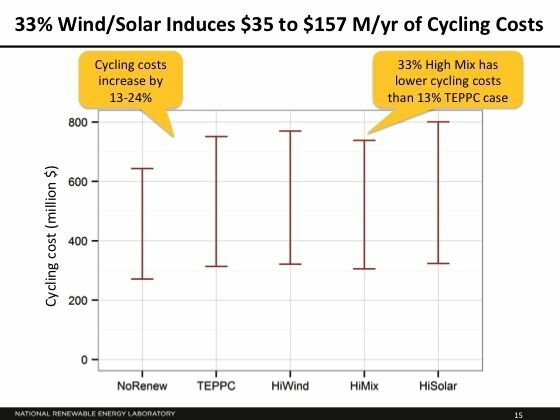 Lew added that in the low 13 percent renewables case, there is a big jump in cycling costs, but a much smaller jump to get from there to 33 percent renewables. 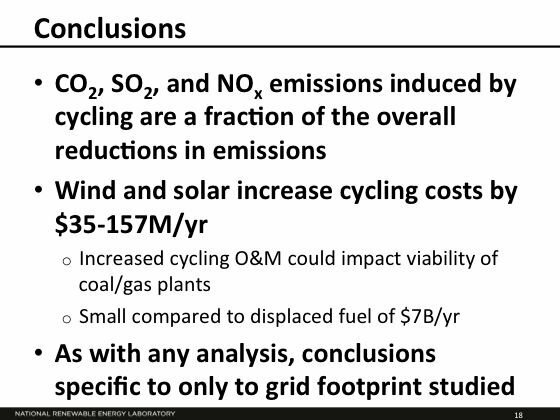 Lew said, "We find that the cycling impacts of wind and solar are small compared to overall emissions reduction."